Mojo Kratom rose to help fill in the demand for Kratom. The popular form Kratoms are consumed is in its powdered form. Not a lot have access to Kratom in this form, and some don’t even like how it tastes. Because of this, people resorted to develop another to consume Kratom with. After a while, people began to develop Kratom capsules to put Kratom powder in. Capsules are often recommended to those who are still starting to use Kratom. Today, taking Kratom as a powder or as a capsule are two of the most popular ways to consume Kratom. Mojo Kratom offers some special Kratom strands through their branded capsules and powders. Kratom is from a tropical evergreen plant which leaves offer mind-altering effects. The plant came from Thailand and grows in other countries in Southeast Asia. Kratom gained popularity for giving users mild-altering and therapeutic effects. Today, many vendors sell Kratom extract in a variety of ways. However, this doesn’t stop the fact that people would still like to find other Kratom vendors like Mojo Kratom. Mojo Kratom products have a distinct look to them. You can spot their products from a mile away, once you get familiar with their branding. Their products will have their voodoo doll mascot on them. The packaging for this brand is colorful and eye-catching. There is playfulness to the design, especially with how cartoony the mascot is drawn on the bags. Bali Kratom packs have the usual mascot. 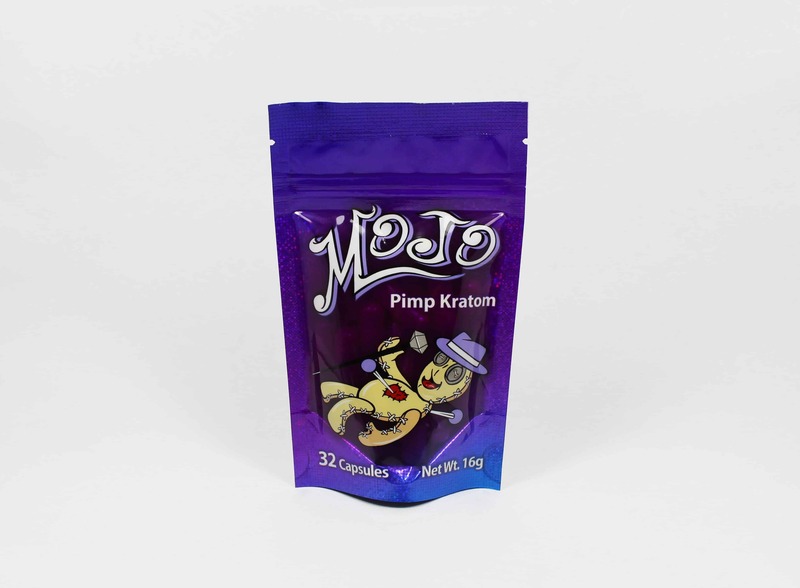 Pimp Kratom packs, on the other hand, have the mascot wearing a purple hat and the pin’s color was changed to purple. This gives an interesting way to tell the strands apart. Mojo Kratom advertises that their Pimp Kratom has high grade of the Maeng Da strain. They call it “Pimp Kratom” since maeng da means “pimp grade” in English. They also say that their Bali Kratom offers pain relief, stimulation, and euphoria. These products are in the default package. Their capsule packs contain 32 capsules, while their powder packs have a net weight of 20 grams. Both packs stand at a good 6 inches in height and are 3 inches wide. This makes the packs pretty small and light enough to carry around. The packs are pretty affordable. Some places offer the Mojo Bali Kratom at $20, while the Mojo Pimp Kratom’s price steeps up at around $25. If you know where to look, though, you can get either one at under $15. Remember to take note of the shipping prices when you buy their products online. When it comes to those who want quality Kratom, they like to try out different strands from vendors. Many do note how Mojo Kratoms are limited in the market, and the number of kinds of Kratom strands they offer varies. You would think that they would offer more in variety to stand out from their competition. Their branding is recognizable, but not everyone is a fan of the holographic foil on the bags. Some people think it’s a cheap way to draw the buyer’s attention. The packs do have net weight listed, but there’s no instruction on how much is the right dosage for you to take. 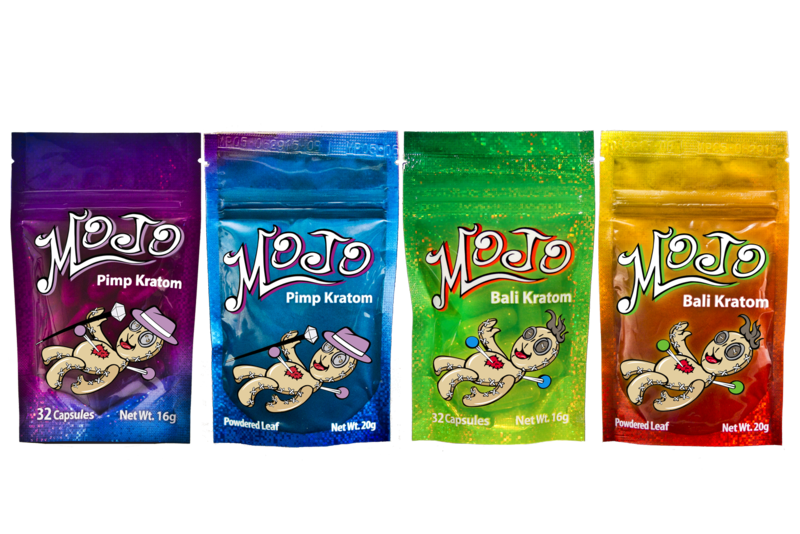 It is clear that Mojo Kratom has a brand that they like to offer to their customers. 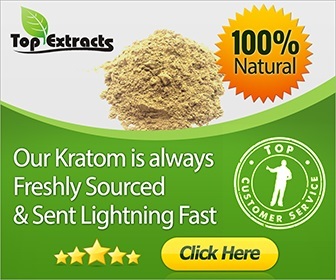 Their prices help Kratom users get capsules and strands at a low price. Their packs can be starter packs for those who want to try Kratom for the first time. If you are expecting the packs to be bigger or have more strands, you are better off looking for more elsewhere. This Kratom vendor has a lot to work on, but Mojo Kratom does carry plenty of potential to grow in the Kratom market.